Don’t commit to a service until you know how often you will use it. Look for services that offer free or nearly free monthly memberships. Jango is a free music service. It allows members to listen to custom radio stations based on genre or musical artist. Members can create their own stations or select from those in the Jango database. Jango’s smartphone apps also are free. TUNEIN has a free level that allows users to listen to 100,000 radio stations and 5.7 million podcasts. com allows users to listen to radio broadcasts live through any Internet connection for free. Slacker offers a free level as well as a $3.99 and a $9.99 monthly levels. The free level lets users listen to six songs per hour. Other streaming sites have a free membership level that is supported by advertising. Deezer’s free subscription level offers unlimited music on computers and tablets, and flows and mixes on smartphones. Google Play Music’s free subscription offers the ability to listen to radio stations and podcasts,on both computers and smartphones and to upload up to 50,000 songs. Spotify’s free level offers users the ability to browse playlists, discover new music and create their own playlists. YouTube also has a paid streaming service, called YouTube Red that offers ad free videos. It can be tried for free for one month costs $9.99 monthly after the trial expires. Families and students are eligible for discounts on Spotify and Apple Music. Spotify’s Premium for Family costs $14.99 monthly for up to five family members. Each member has their account and playlists, but everyone in the household shares the same bill. 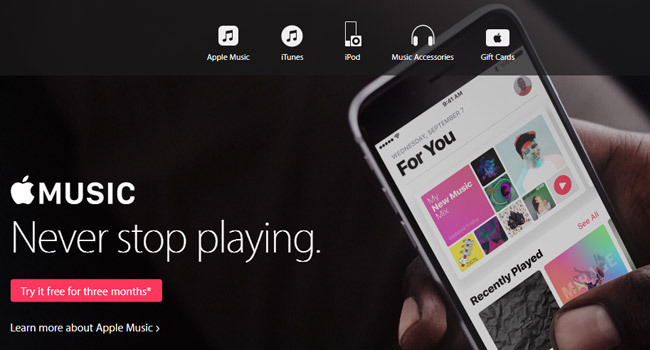 Apple Music’s Family Sharing also costs $14.99 monthly. It allows for six family members to use the serviceand has built-in parental controls. In addition to music, this membership level also includes apps, book, movies and TV shows purchases. Students with an .edu email address can take advantage of Spotify’s student discount. This membership level costs $4.99 compared to the premium membership level of $9.99. Apple Music’s student discount also costs$4.99 and uses UNIDAYS to verify if a member is a current university student. New services and membership levels launch periodically, and these new services can be economical. Recently, Amazon launched Music Unlimited, a streaming service for both Amazon Prime members and nonmembers. The service costs $7.99 monthly for Prime members and $9.99 for nonmembers. Those with Amazon Echo can subscribe to the service for $3.99 monthly. A $14.99 family plan is coming soon. The $3.99 and $7.99 membership levels make Music Unlimited the least expensive of all the large streaming music services. Spotify, Apple Music, Deezer, Napstar and Tidal all charge (lien statista)$9.99 a month for paid subscriptions.